Each year, graduating students come together to raise funds for Neumann University. This longstanding tradition is a way of showing thanks and a commitment to our core values while leaving a lasting impact that reflects the class. Participation in the Class Campaign is your vote of confidence in the education you have received and the opportunities provided to you. Now you can pay it forward so future Neumann Knights benefit as you did. We hope that by giving back, we will help to shape future experiences for Neumann students. Thank you for your support. All donors will receive special recognition in the Commencement booklet. Donors of $50 will earn a Philanthropy Cord. The Neumann Philanthropy Cord is a blue and gold cord worn as a symbol of philanthropic pride that graduating students wear at commencement. It demonstrates your pride and support for your university and the reciprocal commitment between Neumann University and its alumni. 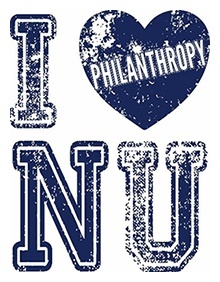 With a gift of $50 or more, you’ll earn a Neumann Philanthropy Cord. Why should I give? Doesn't my tuition cover everything? Many students feel this way. The truth is, tuition only covers 85% of the costs of an education. The difference must be generated through the loyal support of alumni, friends, parents and other revenue. I can't give a lot of money. My gift won't matter, will it? Gifts of all sizes matters! Participation, at any level, effect the University’s rankings and ability to secure additional funds from outside organizations. Also, when you give, others are inspired by your example and give as well. So where will my gift go? You decide! As a donor, you can designate your gift to The Annual Fund, The Scholarship Fund or The Athletic Fund. How can I learn more about the Class Campaign Committee? To learn more about the Campaign or how you can volunteer, contact Allison Purcell ’03, Assistant Director of Annual Giving at 610-361-5422 .